SNTS – Single needle topstitch. SNES – Single needle edgestitch. 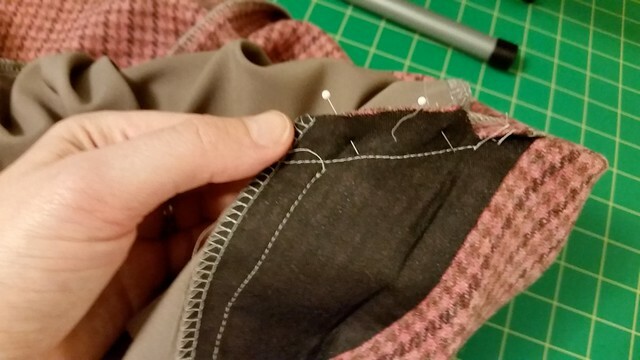 · Pre-Finish rounded edge of each pocket bag for 3” near side seams. 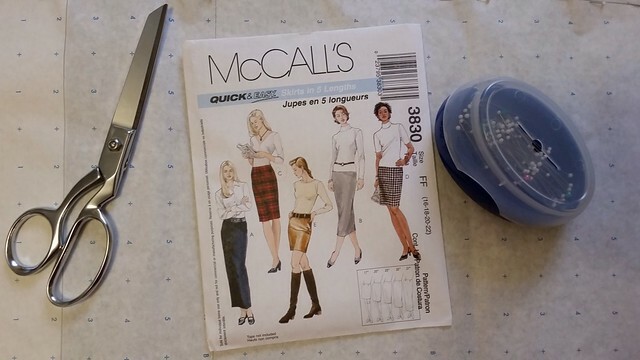 · Sew pockets to skirt side seams 3/8”. Pre-finish skirt side seams together with pocket bags. 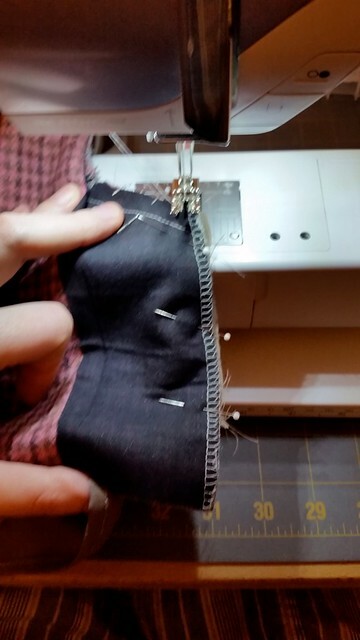 · Stitch skirt side seams breaking thread at pocket opening. · Stitch pocket bags. Finish seam allowances together along curved edge. Press bags toward front and make bar tack at bottom of pocket opening through all layers. Do not clip back seam allowance. Press seams open towards hem. 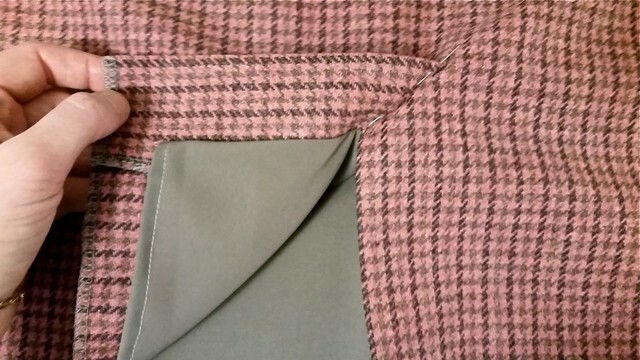 · Stitch back darts and front pleats. 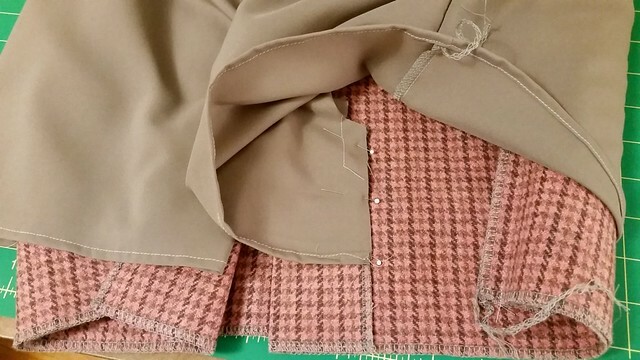 · Pre-finish center seam allowances on front & back skirt. · Skirt will be in 2 sections, right and left. · Stay stitch back neckline. 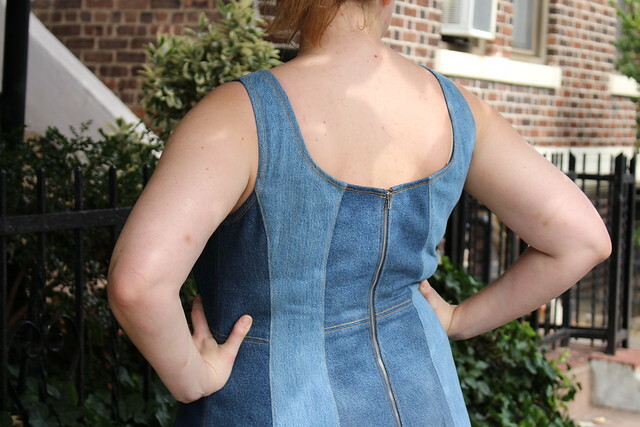 · Sew bodice darts/pleats; front & back. · Finish front neckline edges. 5/8” hem allowance: fold 5/8”, fold raw edge to meet 1st fold. Press and single needle topstitch. 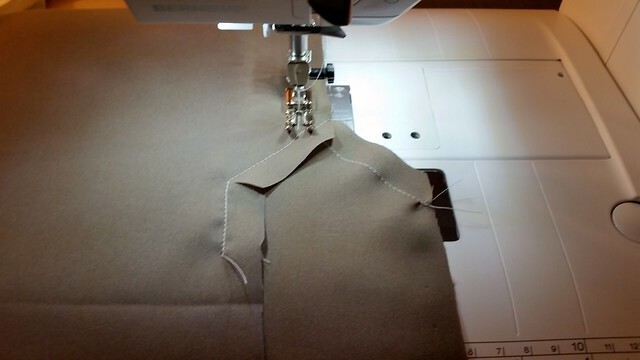 · Baste shoulder seams, side/underarm seams of bodice. 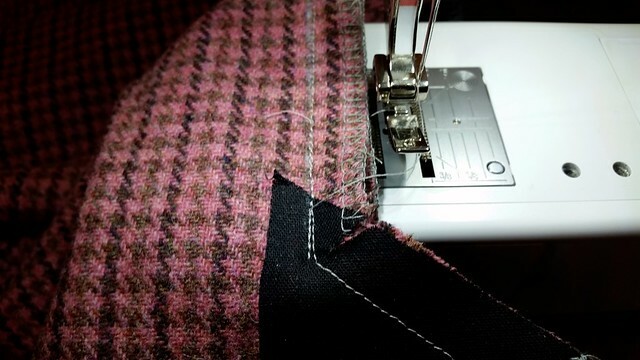 · Pre finish CB seam allowance. Baste skirt pieces together at centers; baste to bodice check fit. Adjust as needed. I reduced the bodice at the side/underarm seams, and the reduced the skirt by deepening the skirt dart and pleat intake. Later I also reduced at the CB seam on bodice and skirt, which decreases the neck width slightly. · Permanently stitch shoulder/sleeve seams. Finish seam allowances together and press toward back. · Permanently stitch side/underarm seams. Double stitch at curve. 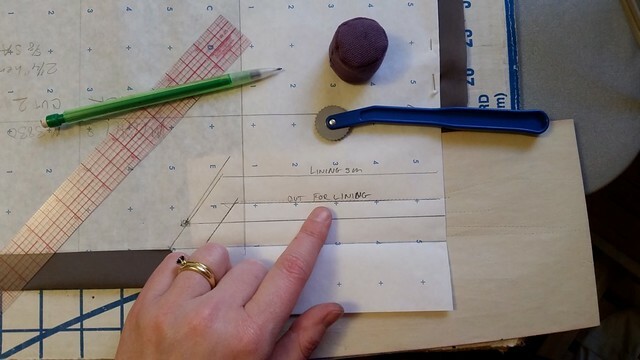 Clip to stitch line at curve every ½”. Finish seam, press toward back. 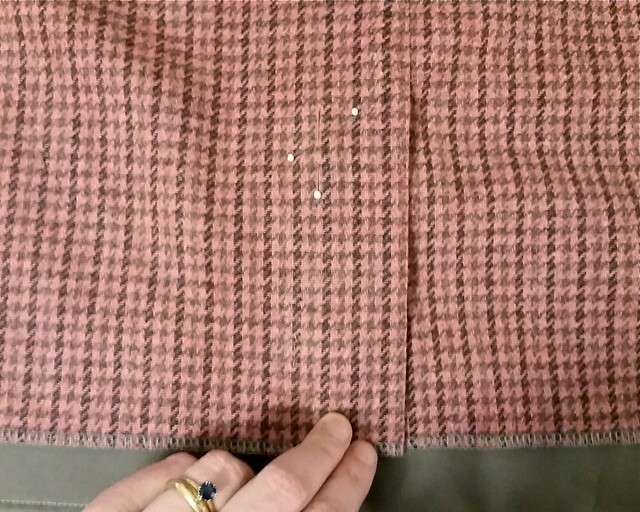 · Permanently stitch the Skirt CF seam. Press open. 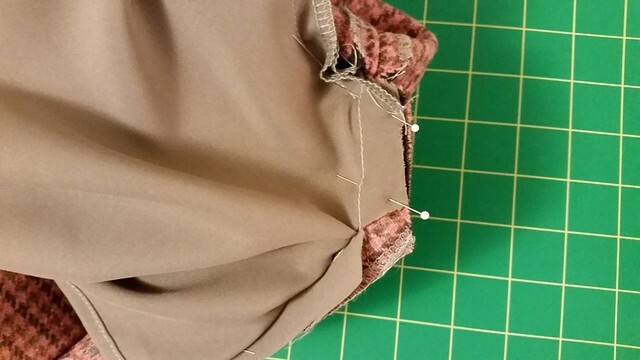 · Permanently stitch bodice to skirt at waist seam. Serge to finish seam allowances and press down. SNES to secure. · Permanently stitch CB seam. Press open. Tack seam allowances open at waist seam. 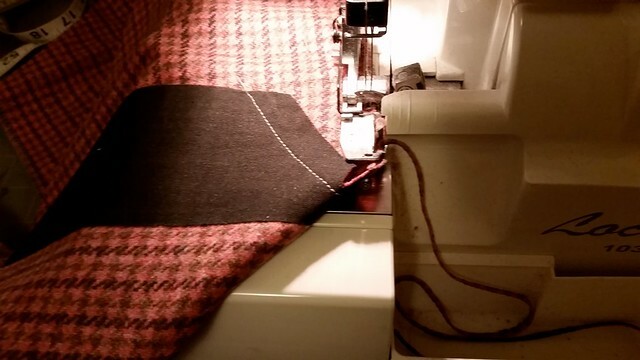 · Finish back neckline with self bias; under-stitch and ¼” SNTS. 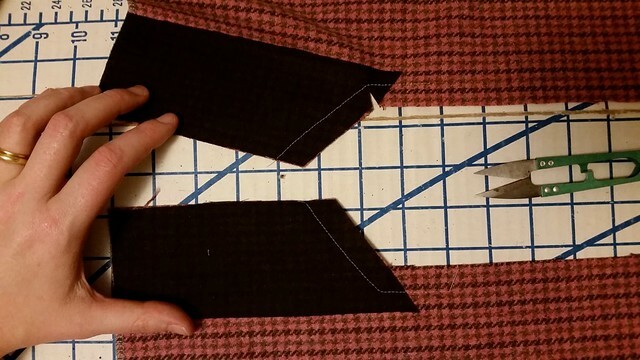 · Hem sleeves: Fold ¼”, fold again 1”. SNTS at edge of fold. 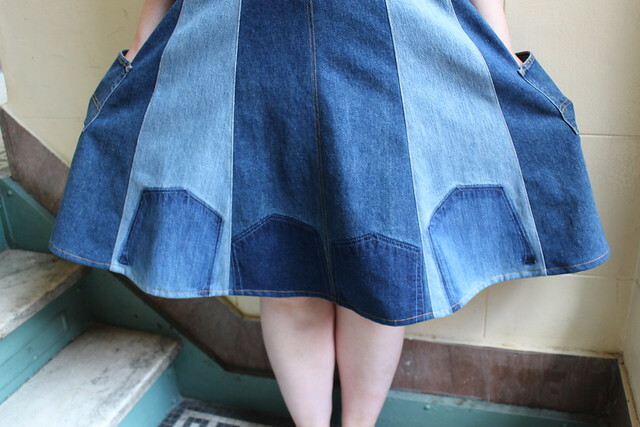 · Hem Skirt: 5/8” hem allowance: fold 5/8”, fold raw edge to meet 1st fold. Press, SNTS. · Optional: Assemble waist tie / self belt: stitch wrong sides together, turn, press, SNES. · Add thread chain belt loops to side seams at waist. 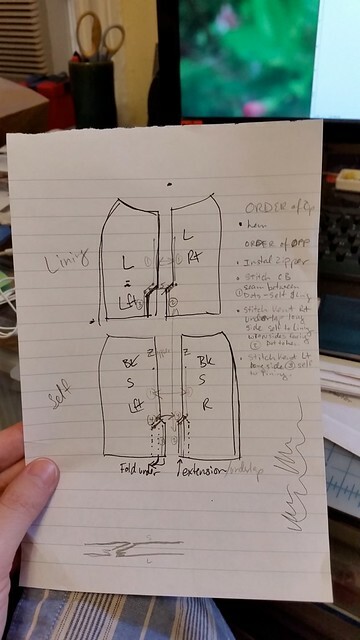 · Add hook and eyes to inside of CF neckline above waist seam as desired. Y'all, taking pictures of oneself is hard. This is the first time I used my camera and remote to take remote pictures of myself and all I can say is thank goodness for that flip out screen! I have so much respect for all of the lovely bloggers who do this on any sort of regular basis. 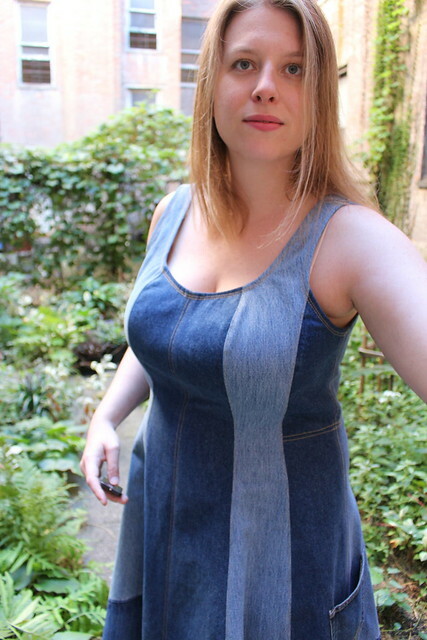 This project is my entry for the Refashioner 2016 Denim challenge. 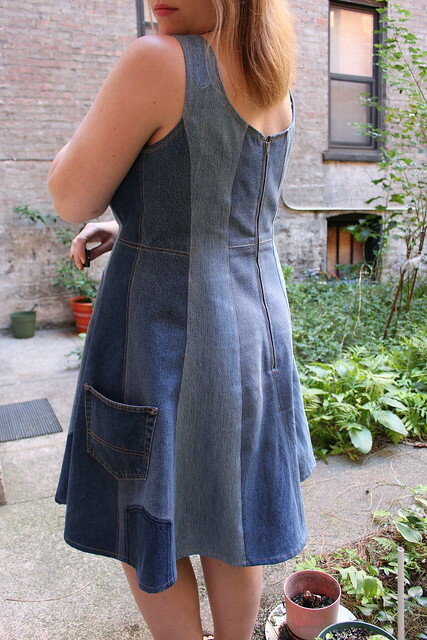 Originally I thought I would make a top a la Rachel Comey, but when I saw Carlolyn's scrappy denim dress I knew I wanted to attempt my own dress. Materials: 3 pairs deconstructed men's denim jeans 100% heavy cotton denim. On pair of light Levis 50ls that I had on hand, a pair of Wranglers and Polo Ralph Lauren that I purchased on sale at a local Goodwill. Jeans sewing thread and top-stitch thread. Pattern: B5745 OOP. 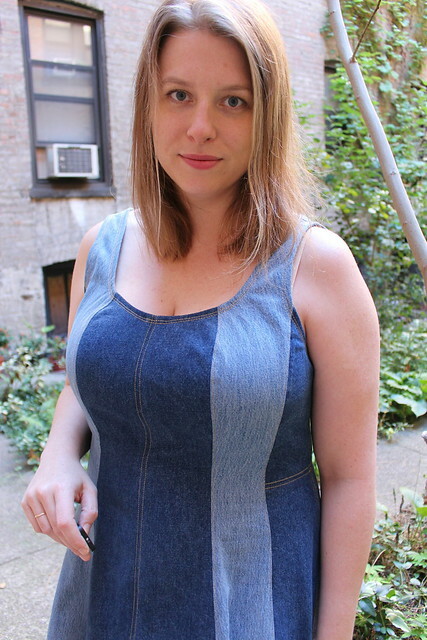 I had this in my pattern stash for a while and it actually lists denim as one of the suggested fabrics. It is a fit & flare dress with multiple panels and multi cup pattern pieces. Cutting Notes: The challenge was to turn denim jeans into another garment, I had to fit the pattern pieces carefully onto the denim. 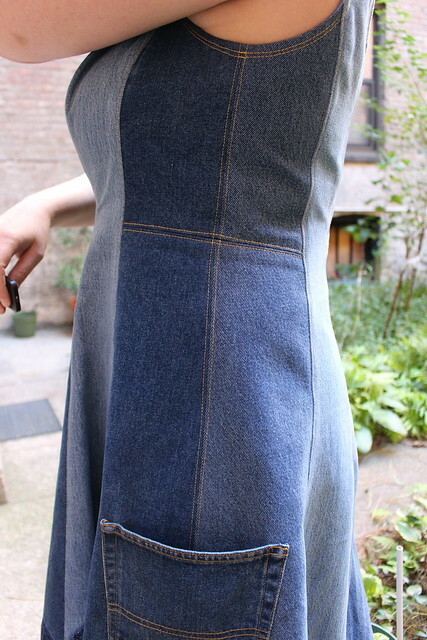 Also, the denim is quite heavy and was to hang from rather narrow straps so I wanted to reduce the flare of the skirt. Therefore, I removed 1" from each panel seam at the hem (2 inches per seam, which is something like 18" total!!!) and blended through the hip. The only place I did not reduce was the CF seam, which are straight. I liked that the front was low but the cup shaping prevents it from gaping scandalously and the low back makes it very comfortable in hot weather, which was somewhat surprising given the heaviness of the fabric. 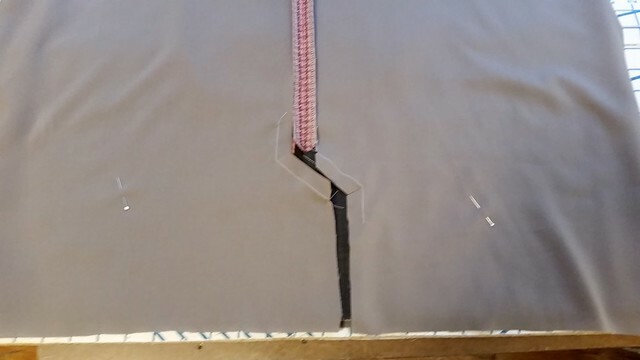 Construction Notes: The CF, CB and side seams are all over-locked before seaming, pressed open and then top-stitched 1/8" on each side of the seam. I used purchased navy single fold bias tape instead of self bias to face the neckline and armholes. 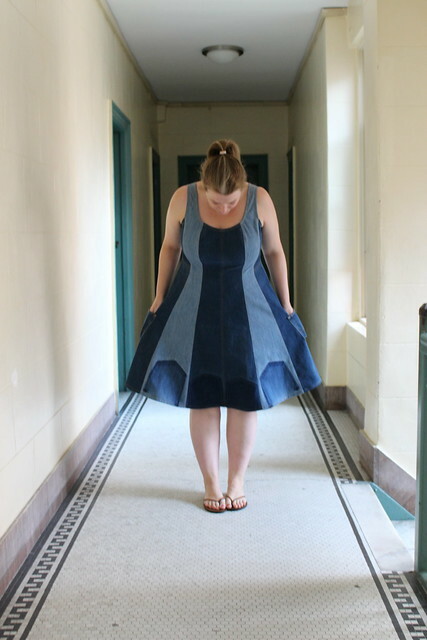 My Bernina handled the heavy denim like a champ, but adding further bulk in those areas wouldn't have been a good idea. I installed a metal zipper instead of an invisible zipper and I applied it so that the teeth would be exposed. 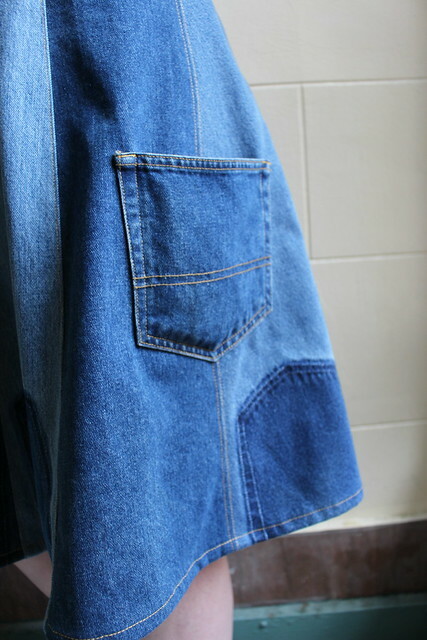 To further use the denim material I added two of the jeans pockets to the sides where my hands fall. They feel a little awkward that far to my side, but I like the way the placement looks centered on the side seam. I thought about adding more of the pockets, but I haven't settled on any placement that I liked. I'm delighted with the way this dress turned out. It's very comfortable, cute, and appropriate to wear as a transitional garment for fall. I've enjoyed wearing it this weekend as the weather cools off and I really enjoyed participating in the Refashioner challenge this year. I need more basics in my wardrobe and like wearing pencil skirts so I decided to make one. I went stash diving and came up with some wool houndstooth and one vented skirt pattern by McCalls... M3830. It's a favorite TNT on patternreview.com. The only problem is that isn't lined. Excuse my mini rant: This is the only pattern I was able to find currently available for purchase that has a CB overlapping vent, and it doesn't have a lining. I'd venture to guess that's how they can justify calling it "Quick & Easy", which it certainly is. I'm a just bit peeved that there is no intermediate version for sewists who've made a few garments before and just want to make a basic skirt to rival what can be bought for $90 at LL Bean. Sigh. Fine. I can add the freakin lining myself. I like pattern-making after all and have drafted vented, lined pencil skirt in my sportswear pattern-making class at FIT. So I located my drafting notes, but unfortunately the sewing order of operations are missing. Drat! Then, after several evenings perusal of my entire sewing reference library I discovered that I have no references for this basic design detail. Vogue Sewing, McCalls, several vintage Singer books and the Singer Reference Series, my beloved Reader's Digest, every book I have by Claire Shaeffer and Nancy Zeiman.... none of them covered how to sew a lined skirt with a center back vent. Imagine my surprise and dismay. Well, what could I do other than figure it out my damn self? Nothing, so that is just want I did. Of course I took pictures on my cell phone while doing so... someone had to! * I cut the side seams an extra 1/8" wide so that I would gain 1/2" total all around for ease. * I raised the center back seam 1/4" at the waist blending into the back waist darts. 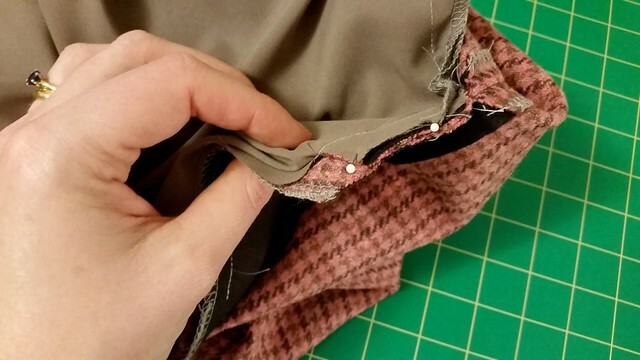 This adds a little vertical ease in the center back seam for ones bum and ensure that the lining doesn't end up too short which would cause the vent to hike up. * I cut the hem 1" shorter than the self. Note: If your fabric has no discernible face as mine did, it helps to do each part of the self and lining prep in tandem to ensure that the pieces are being placed in the correct orientation. Or draw yourself a diagram, as I did. 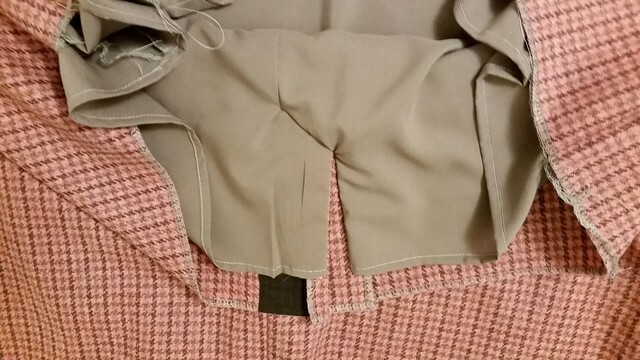 Stitch waist darts (press to CF/CB) and stay-stitch waist seam. Stay-stitch vent inner corners. Clip to dot. Insert Zipper into CB seam above dot. Stitch backs to front at side seams. Press open. Prepare the Lining: Note: seam allowances will be between the lining and the self. Baste waist pleats (pleat uptake to sides) and stay-stitch waist seam. 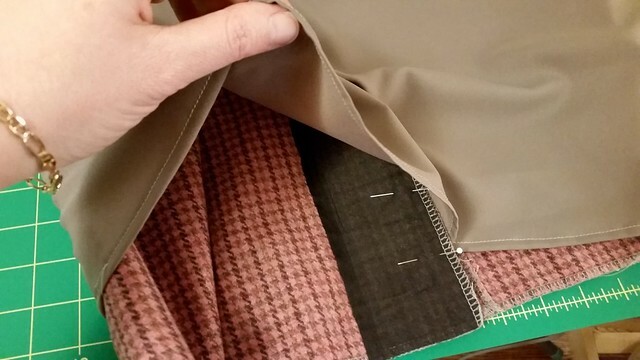 Stay-stitch wearer’s right Lining Vent corners. Clip to dot. Stitch backs to front at sides. Finish using your chosen method. Hem Lining shorter than Self final length. I actually finished my CB seam allowances after stitching the CB seam, but I wouldn't do it that way again. Note: Some of these seams will require starting precisely at seam lines rather than the fabric edge. Tuck all the angled seam allowances up. Match the stay stitch lines. Stitch angled top seam of Vent on self and lining, all layers together, starting at the inner seam-line dot. 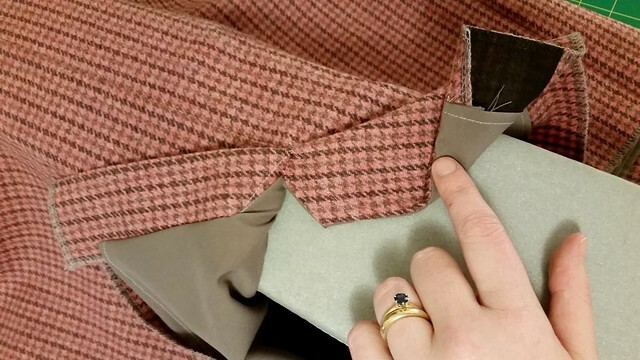 (4) **This will require reaching between the Lining and Self layers** Press seam up. Topstitch across angle at top of vent through the wearer’s left side self and vent bend back only to secure. Continue with remaining skirt construction: Self hem and Waistband. 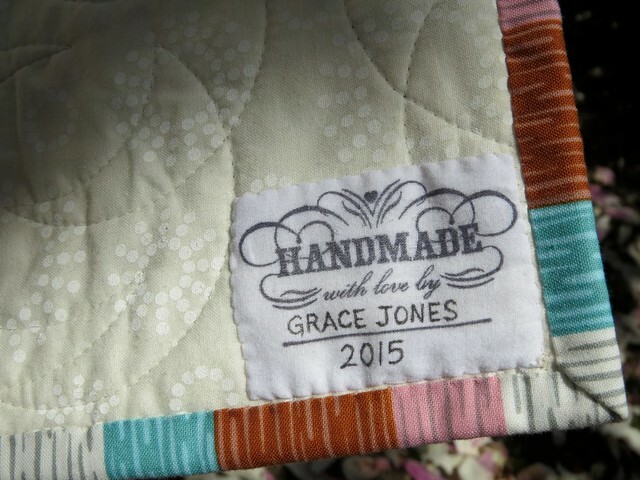 Not just another baby quilt. This one is for a BOY, and I'm not related to him. 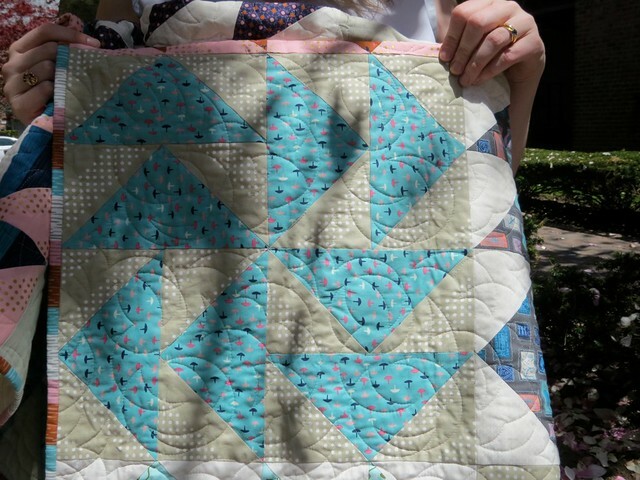 of course I jumped at another chance to make a baby-sized quilt. 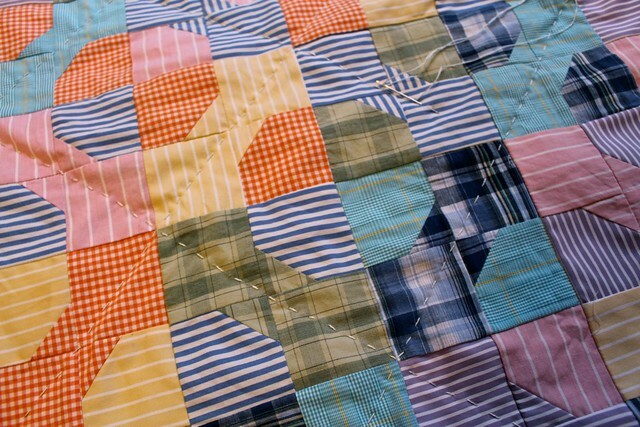 This quilt is also special because I didn't use quilting cottons. 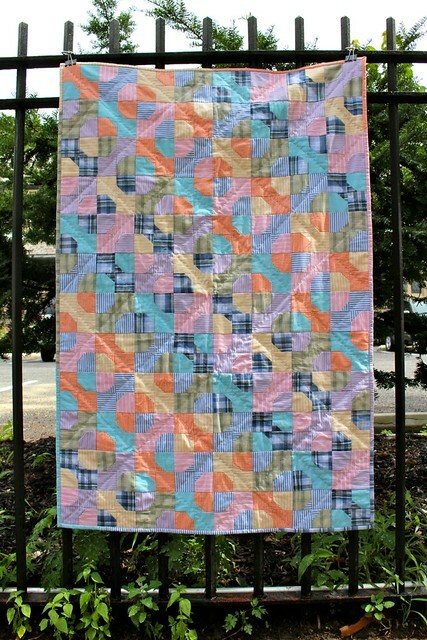 The fabrics for this quilt are entirely 100% cotton shirts that I thrifted and washed and sliced up. There are lots of progress pics on my instagram so I'm just posting the finished photos on the blog. 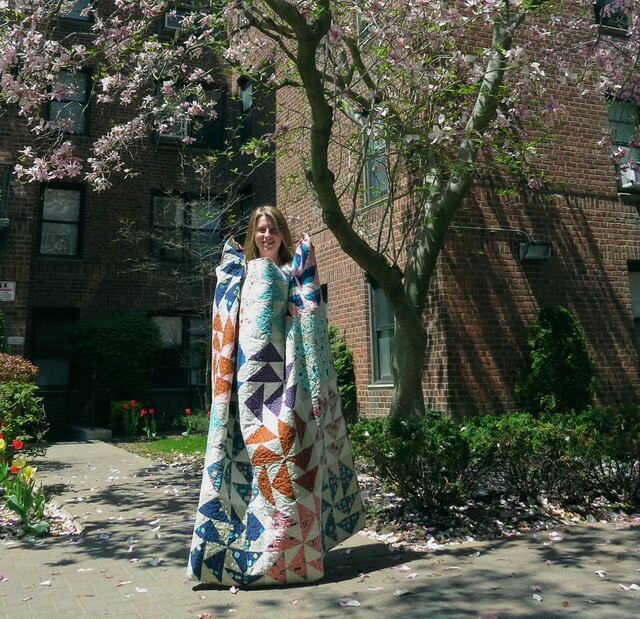 I also designed this quilt myself. Winging it means I designed it right? I hand quilted this one using the big stitch quilting technique and DMC perl cotton thread. 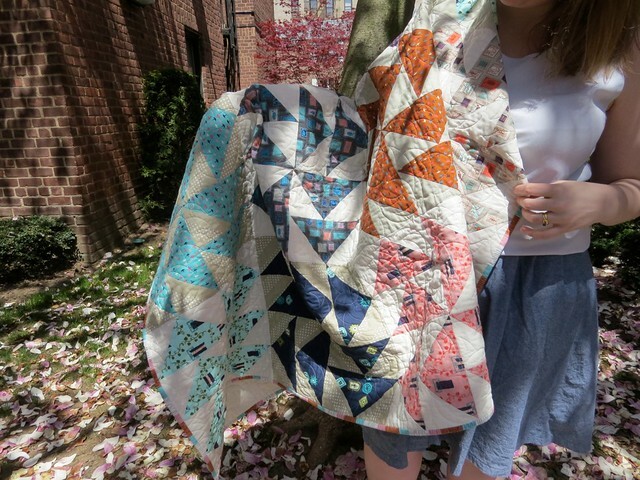 This quilt was made for a friend this past winter/spring. She was furnishing a new apartment and I know a good excuse when I see one. The fabric is from a kit I bought on craftsy, although the pattern can be acquired for free on the Cotton and Steel website. I changed the design a lot because with the limited palette I thought the design was a bit boring. I'm starting to see that I like the limitations of a kit but like to change up the design. I am very proud of my points. Quilted as usual by the lovely Linda Lovett. More pictures on her blog. Another one of my cousins had a baby! Last fall. Oops. Bad blogger. 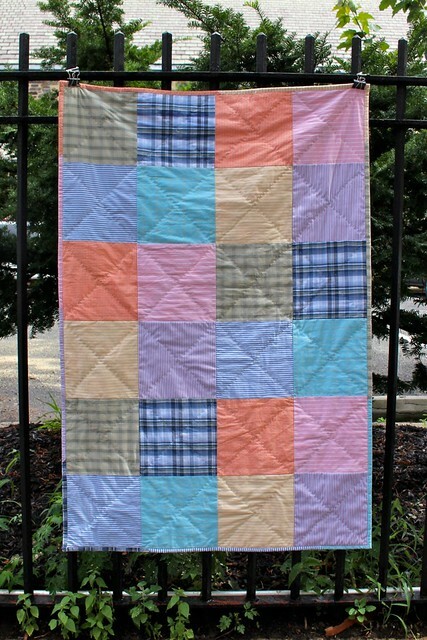 In my defense, I sent this quilt to them right about exactly the time the lovely Lena made her entrance into the world. I just haven't had the blogging mojo to brag about it. Anyhoo. This is the quilt. Hubs makes an adorable model. I had to give up on the idea of there being a "right side up", although this is technically sideways. Pattern: Disappearing Nine Patch; some variation I made up after a bit of googling. I'm sure I got the idea from one of the Missouri Star Quilt Company YouTube videos. Fabric: Wee Wanderer Twilight Palette by Sarah Jane for Michael Miller. It was a fat quarter bundle and I got some extra yardage from City Quilter. I also used some scraps from Ali's quilt on the back. 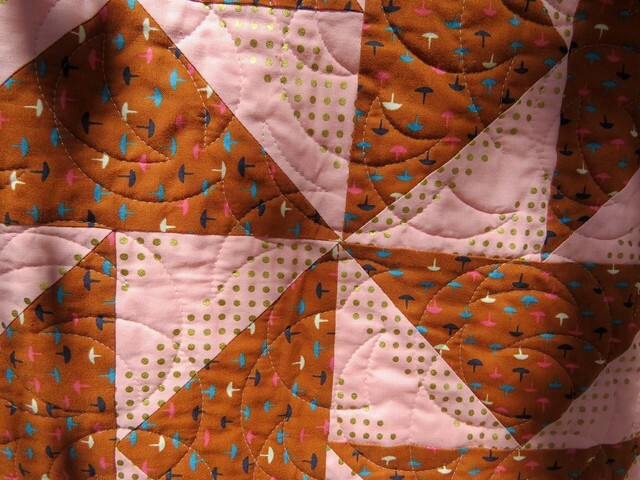 Quilting: I love this pantograph! 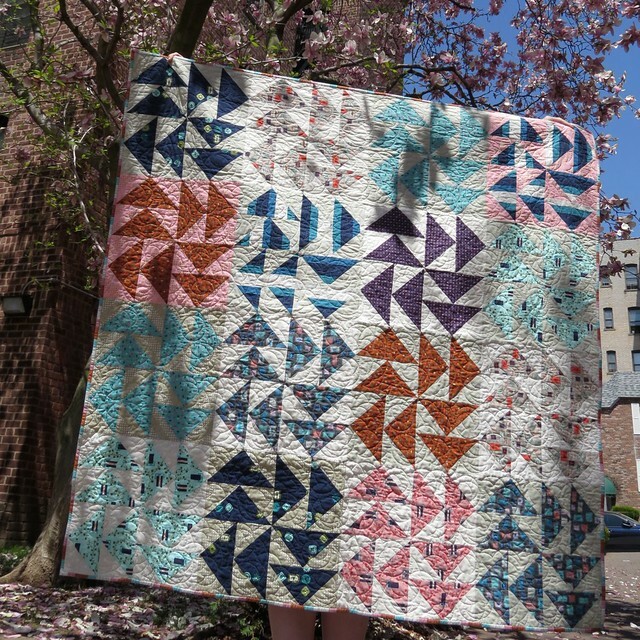 It's called Spiral Braid and was quilted by the lovely and wonderful Linda Lovett who has more photos on her blog of the quilting process. Linda is fantastic to work with; I highly recommend her. Copyright © 2012 - Restless Grace. Simple theme. Powered by Blogger.